Bot builder from Microsoft has been around for a couple of years now. During Build 2018 a preview of version 4.0 was launched with support for more languages. Previously you could only build a bot in C# or Node. Now you can build one in Java or Python too. In this post I will take you on a short tour through the Java version of this framework and show you how it works and what you can expect in the near future. As of the moment of writing, the Bot Builder SDK for Java is still in preview. And it is a really early preview. They published the bits on Maven Central, but something failed and you can't use it from that location. To get the bits, there are a few steps that you have to perform on your machine. This will compile, test, package and publish the project to your local maven repository. Once you've done that, you can add the Bot Builder SDK to your Java project. When you build a chatbot with Microsoft Bot Builder you are building a REST service. The REST service accepts incoming chat messages and handles them by sending replies to the user through the bot connector client. 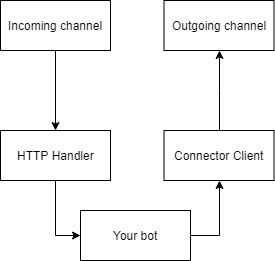 The image below give you a short overview of the structure of what a typical bot looks like. There are many implementations of web frameworks in Java among which Spring Boot is a pretty big one. But today I'm not going to show you how to build your bot in Spring Boot. Instead I will show you a very basic bot on top of Tomcat a standard implementation of the Java Servlet API. The first thing you need are the tomcat dependencies and something that can serialize/deserialize bot framework messages. The tomcat dependencies are provided by Tomcat so I don't need to package them with my web application. That's why I used the <scope>provided</scope> for that dependency. The other dependency you need is the jackson object mapper. Jackson is the go-to library for working with Json in Java. Because bot framework sends date values you need to include the joda time module for Jackson as well. You implement the bot interface as a HTTP servlet. This servlet will provide the gateway between the incoming channel and the bot. // If not, this raises an authentication exception. // The outgoing messages are not sent as a reply to the incoming HTTP request. // Instead you create a separate channel for them. // Always send a HTTP 202 notifying the bot framework channel that we've handled the incoming request. Despite the fact that the HTTP servlet performs a basic task, it still contains a lot of code to go through. So let's break it down, step by step. The class itself derives from HttpServlet a standard class that any web application on a Java web server needs to derive from. Incoming chat activities are sent to the bot using POST requests. So you need to override the doPost method. This method has a request and response object. In the doPost method you then need to deserialize the incoming data from the request and validate that the sender of the request has a valid Json Web Token in the authorization header of the request. The authentication check is done entirely by the Bot Builder by calling JwtTokenValidation.assertValidActivity(...). You don't want to build any of the JWT stuff yourself. When the token is valid, you can send the activity to the bot implementation. I advise you to do the implementation of the actual bot outside of the HTTP servlet. It makes things a lot clearer for your future self. Note that you need a BotConnectorClient instance in order to send any responses to incoming messages. In my bot I've created a ConversationContext that holds the connector for outgoing messages and the incoming message. This makes it easier for me to perform basic bot operations. Note that right now you have to build this class yourself, but in a future release of Bot Builder for Java, a standard one is included and will probably be called TurnContext instead. As I mentioned before, it's a good idea to keep the message handling separate from the HTTP interface of your bot. When the bot receives an activity that is a message, it will take that message and create a reply for it. It then copies the user message into the reply and sends it using the bot connector client. Notice that right now, Bot Builder for Java doesn't have the right convinience methods for creating replies to incoming messages. So I took the liberty of looking at the C# source code and created my own ActivityFactory to solve the problem. When you want to send an activity, you need to create one based on the one you received earlier. The incoming activity always contains a serviceUrl property that contains the URL to send any outgoing activities to. Also, when you create a reply, you need to specify to which conversation and user you want to send the reply. In my implementation I simply switch the from and recipient property. Once you created a reply, you can send it through the bot connector client. To make things easy, the ConversationContext contains a convinience method that handles sending activities. As you can see, it doesn't take a mountain of code to build a bot with the current preview version of Bot Builder for Java. But there are quite a few things missing still. You could build a complete bot with the bits that are available. The connector bits are easy enough to handle. You can focus on the conversation structure. In the next few months, Microsoft will keep working on adding more features to the Bot Builder for Java SDK. For example, in C# you can already build simple dialogs. This will come to Java as well. Also, there's no easy way to perform intent detection. This will also be added in a future preview. Right now you can use a basic HTTP client implementation in Java o cess LUIS (Language Understanding Intelligence Service) as a REST service. I expect that there will be a proper client for it soon. Where do I find the bits? I've embarked on my hardest and most fun adventure ever. I'm going to implement my own deep learning framework. I know most people will call me crazy. But I think this is a challenge that was long coming and I finally got around to it. Wonder why? Read on. When you're not into building your own machine learning models or neural networks, but still want to do something with AI to recognize images, then Microsoft has you covered with the Computer Vision API as part of their Cognitive Services. Wonder how to use it? Learn it here.